After adding up last year’s successes and failures, it became apparent that I’m a horrible marketer. I have vowed to change that this year. By including some advertising, setting a book free on Kindle, bumping my prices just over the 2.99 dead-giveaway-that-you’re-an-indie-author and avoid-it-like-the-plague price range, and upping the number of bloggers I contact for reviews, I’m taking baby steps in the right direction. It’s time to share how my first foray into advertising went. I just learned how to take screenshots. Pretty cool, huh? 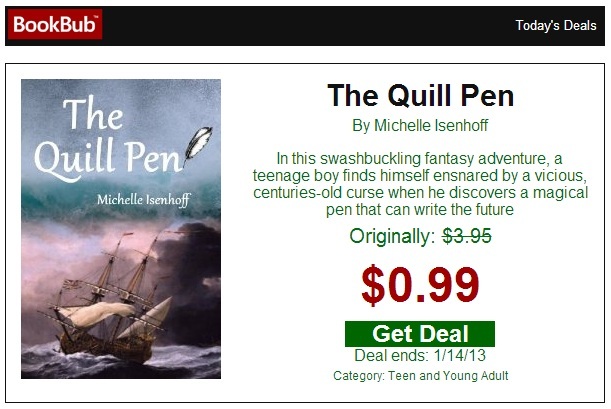 Early in January I took out a $60 promotional ad for The Quill Pen with BookBub. They are a website that sends out one daily ebook bargain for each of its genres. Members choose their favorite genres and get only the notifications of interest to them. So my promotion was emailed to readers who expressly wanted to read teen books. Kind of a clever way of doing business, isn’t it? When you sign up for your ad, BookBub predicts an average number of sales for each genre. It’s not a guarantee, but it gives you an idea of what to expect and helps you gauge whether the expense is worthwhile. My given average was 200-300 sales. Now to advertise on BookBub, you have to mark your book at least half off. I marked mine down to $.99 from $3.95. That’s a nice, hefty 75% off for readers. Tough number to resist, isn’t it? Everyone likes to feel like they’re getting a deal. But when I drop my price below $2.99 on retail sites like Amazon, my royalties drop from 70% down to only 35-40%, depending on the site. That means I only make about $.35 to $.40 per sale. So I’d have to sell roughly 175 books to break even. The promotional ad also included a link to Smashwords, but figuring out Smashwords reports is sort of like “figuring your income tax with an abacus,” to quote Catherine Ryan Howard. I have no idea how many or what books I sold, but my total sales figure went up about two bucks over the weekend. Assuming they were the result of my ad, that brings my grand sales total to about $128.00 (345 books). My net profit, therefore, would be about $68. Not a huge amount, but worthwhile. The surge in sales also seemed to up visibility on B&N and Amazon as sales on each site continued to dribble in for the rest of the month. They even continued on B&N after I raised the price. All in all, a successful venture. I will certainly list another book with BookBub at a later date. Nice! This is cool to learn about! I think so too. I’m learning new stuff all the time! Fascinating. And good information. So glad to hear you hit your sell-through point (and beyond). Plus, the visibility and increased readership will hopefully have a good impact on future sales as well. That’s a good point about disabling all other channels at Smashwords, because it does take Amazon awhile to get the price back up after you’ve dropped it. I’ll have to keep this in mind for future endeavors. I’ve kind of pulled back from marketing until I’m ready to go with my next novel. Granted, I have some shorts out there for purchase, but I don’t want to do much more until I have another novel. Will look forward to hearing future reports on your progress, though. I understand about wanting to get that next novel out. They say the more you have out, the more exposure you’re giving yourself. I think I am starting to get some cross sales, but then, all my figures are very small. It’s just no fun to market. I’d much rather write! You really have to be passionate about writing to do all you do. I am learning a lot from you. Fascinating info. I have to be passionate about SELLING, too, which isn’t any fun to work at, lol.